Organizations of every kind—from churches to law firms—use LibraryThing to create a online catalog of their books. It's an easy, cheap and fun solution to getting your books online. 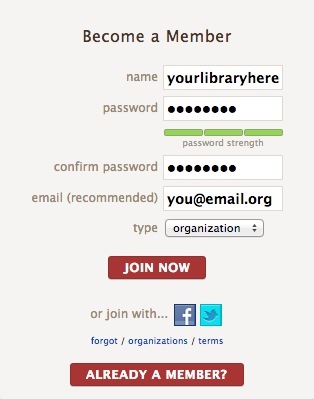 To become an organizational member of LibraryThing, Create a new account and choose "organizational" during sign up. If you are already a LibraryThing member, go to Edit Profile and Settings and choose "organizational" from the drop-down menu. Organizational accounts cost the same as personal accounts—free to 200 books, $10 for a yearly membership, $25 for a lifetime membership. Organizational accounts are limited to a total of 20,000 books. Attention schools: because we have to comply with the COPPA law, our Terms of Service state that no one under the age of 13 may sign up for an account. Choose a category (eg., business, museum, synagogue) and be connected to similar organizations. Organizational accounts get a special profile box and are listed together elsewhere on the site. LibraryThing Local connects members to the real world of bookstores, libraries and book events. Add your bookstore or library as a venue or claim one that has already been entered. You can add a description, photos, hours or events. Turn your LibraryThing collection into a sleek online catalog with TinyCat! TinyCat is powered by LibraryThing, and gives your visitors and patrons a simple, powerful way to explore your library's holdings. You'll also have access to an admin portal that allows you to customize your catalog, run circulation on your items, track patron information, and more. To learn more, visit https://www.librarycat.org/. Booksellers. Booksellers may list books, but not use LibraryThing to sell books. They are strictly forbidden from soliciting other LibraryThing members. Suggested uses include tracking staff picks, posting events and socializing with neighbors. Pay-for-review sites. LibraryThing may not be used by or in conjunction with pay-for-review sites. See the Terms of Service for other prohibited uses. For more information, see FAQs for organizational accounts.